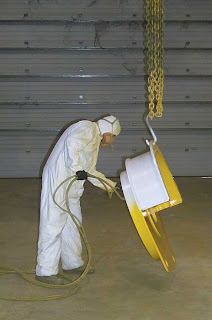 American Crane can meet your Coating Requirements. EXPERIENCED – Our Coating Technicians have applied numerous coating systems including Epoxy, Enamel and Zinc rich formulations. QUALIFIED – All our Coating Inspections are performed by Certified Coating Inspectors and surfaces/coatings are prepared in accordance with various SSPC Standards (including near white blasting to SSPC-10) in addition to stringent Nuclear Quality requirements. FLEXIBLE – We will perform Coating Services at specified site locations. THOROUGH – Our Coating Technicians verify proper surface preparation, monitor environmental conditions (to prevent coating failures), and inspect for dry film thickness. For more information about our coating services click here. Visit our homepage, email, or call us at 1-877-877-6778 to learn more about our products and services.